Ellee on tour. Photo via author’s website. This interview with guidebook author Ellee Thalheimer was originally published in July 2012. 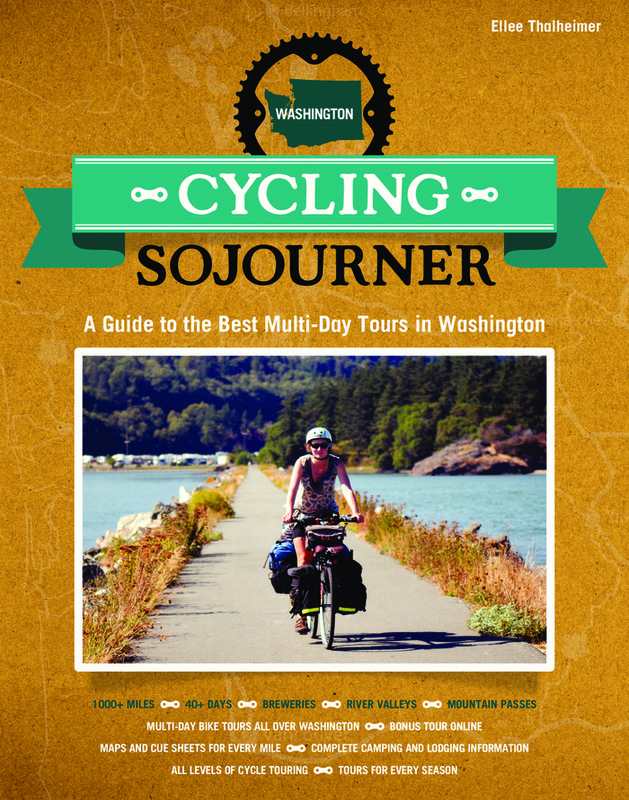 I am reposting it to celebrate the release of her new Washington state bike touring guidebook Cycling Sojourner: A Guide to the Best Multi-day Tours in Washington! Click here to purchase your own copy of this awesome book. 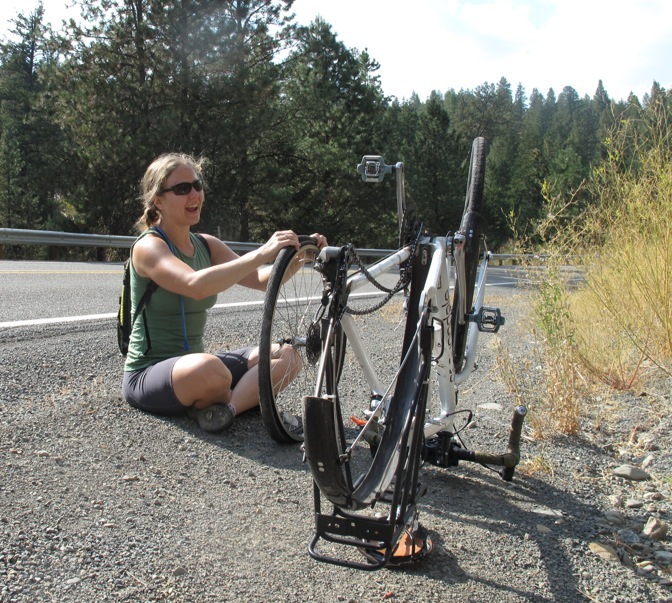 Portland, OR’s Ellee Thalheimer is an author, freelance travel writer, and avid bike tourist. 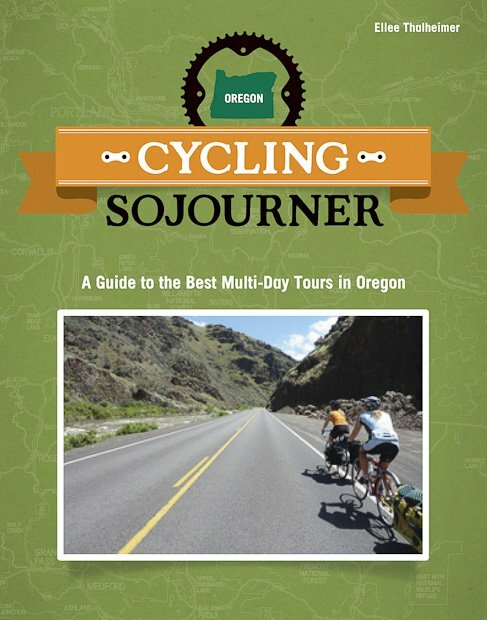 Her newest book, Cycling Sojourner, is a guide to multi-day, self-supported touring in Oregon, the only one of its kind for the state. I reviewed the book last month then finally got a chance to talk to Ellee as she wrapped up her book tour and some exploratory bike touring for another potential touring guide. We spoke about her past experiences touring nationally and abroad, her background in writing, her process for Cycling Sojourner, and more. The nine tours in the book provide meticulously laid out nuts and bolts information, including cue sheets, maps, and information about weather, difficulty level, camping and lodging options and how to get to the ride’s start. Yet, the soul of the book lies in the voices of the five authors, four of whom are Washingtonians, who use storytelling, local history, and humor to elevate the book beyond just an everyday guidebook to an inspirational muse that draws out your inner adventurer. I wrote two chapters for Cycling Sojourner. The first: an easy overnight tour from Seattle to Tolt MacDonald Park in Carnation targeted at beginner bike tourists looking to get their feet wet and experienced tourists looking for an easy escape from the city. The second: a challenging, rewarding, beautiful tour of the Olympic Peninsula. Riding the Peninsula was one of the most spectacular bike adventures I’ve ever had. I wrote a little bit about the experience for the Cycling Sojourner blog. Interested in getting your hands on this awesome book? You can buy a copy from The Bicycle Story! Get inspired for many summer’s worth of adventures AND support The Bicycle Story’s work. It’s a win, win! A guidebook to navigating Portland, OR’s craft beer world by bicycle seems like a painfully obvious thing. They are, after all, two of the city’s two best known features. Nonetheless, it took until 2012 for that book to be written. Due to be published in November of this year, Hop in the Saddle is a 96-page guide to Portland’s breweries, bottle shops, bars and restaurants and how to get there by bike. It is written and designed by three Portland women, Lucy Burningham, Ellee Thalheimer, and Laura Cary. Burningham is a freelance food and drink writer whose work has been published in the New York Times, Saveur, Bicycling, the Wall Street Journal, and more. Thalheimer is a bike touring guidebook author who’s written guides to touring Italy, Oregon and elsewhere. The Bicycle Story reviewed her latest guidebook, Cycling Sojourner, and interviewed Thalheimer earlier this summer. Cary is a graphic designer and did the design work and illustrations for Hop in the Saddle. 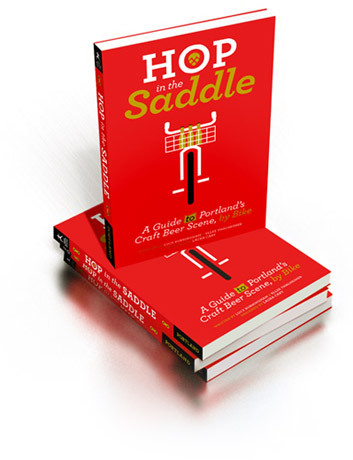 Like many independent writers and publishers these days, the Hop in the Saddle authors are hoping to fund the publication of their book through a Kickstarter campaign. Kickstarter has, without a doubt, provided the opportunity for many authors to publish their work that could not have afforded to otherwise and I suspect Hop in the Saddle is in a similar situation. As I write this, they are currently a little over one third of the way to their $15,000 goal, but still have 16 days to reach it. Check back here in a few weeks for a review of the guide.